College Coach? Click here to view all of Larissa's information. My name is Larissa Ramirez and I am a 17 year-old Senior at Incarnate Word High School. I have been playing organized volleyball since I was eight years old and first fell in love with being able to underhand serve over the net. Since then I have played continuously in school and competitively in club. Now that I am an upperclassman in high school I have developed goals for myself to not only play competitive, fun, collegiate volleyball, but also to attend a school where I can be academically challenged. I have always had a competitive and determined personality. I am also someone who people generally say “never stops smiling”, which is why I have never let negativity effect me in my daily life or as a player. I believe I am an outgoing person who has a natural ability to lead, and I bring positive energy to the court to get the job done. 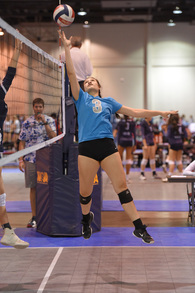 Notes: 2019 upcoming club season beginning in December 2018. Notes: Starter, Captain, Qualified for 2018 USA Girls Junior Nationals in Detroit, Michigan.